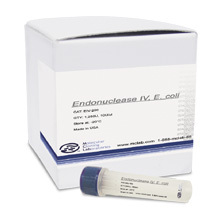 Endonuclease VII is the product of gene 49 of bacteriophage T4. It has a mass of 18 kDa. T4 Endonuclease VII involves in DNA-packaging, genetic recombination and mismatch repair in vivo. 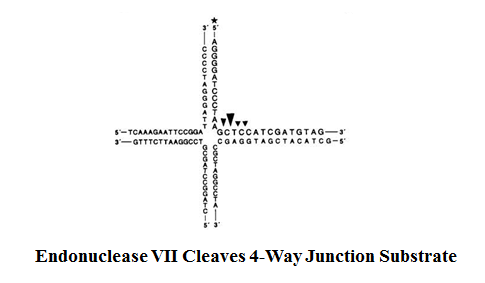 It has also been demonstrated in vitro to resolve single-base misparings, heteroduplex loops and branched DNAs, such as four-way Holliday junctions and three-way Y-structures. One unit (0.5 ng) of the enzyme resolves 50% of 1 pmol FAM labeled 28mer oligonucleotide substrate  within the immobile 4-way Holliday junction structure in 30 minutes at 37°C in 50mM Tris-HCl, pH 8.0, 10mM MgCl2, 10mM 2-ME and 0.1 μg/μl BSA. Figure1. 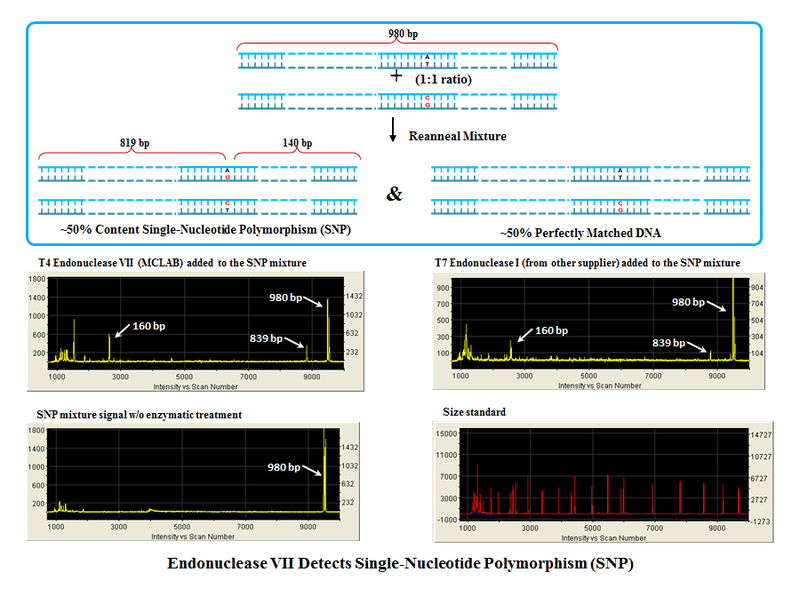 Performance of MCLAB’s T4 Endonuclease VII analyzed by capillary electrophoresis. 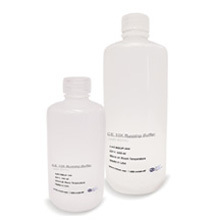 (a) Negative control sample analysis, 10 pmol of FAM labeled 28mer oligonucleotide substrate. (b) 40 U of MCLAB’s T4 Endonuclease VII was able to fully resolve 10 pmol of FAM labeled 28mer oligonucleotide substrate with a 4-way Holliday junction structure (30 minutes at 37°C in 50 mM Tris-HCl, pH 8.0, 10 mM MgCl2, 10 mM 2-ME and 0.1 μg/μl BSA). Figure2. MCLAB’s T4 Endonuclease VII and T7 Endonuclease I (from other supplier) activity comparison. 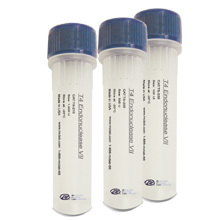 (a) 10 U (275 fmol) of MCLAB T4’s Endonuclease VII can resolve 64% of 10 pmol of 4-way junction substrate (enzyme to substrate molar ratio 1:70) in 30 minutes at 37°C in 50 mM Tris-HCl, pH 8.0, 10 mM MgCl2, 10 mM 2-ME and 0.1 μg/μl BSA. 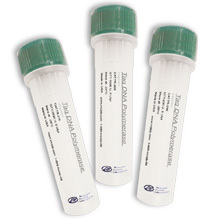 (b) 40 U (368 fmol) of T7 Endonuclease I (supplier N) only resolves 43% of 10 pmol of 4-way junction substrate (enzyme to substrate molar ratio 1:50) in 30 minutes at 37°C in 50 mM NaCl, 10 mM Tris-HCl, pH 7.9, 10 mM MgCl2, 1 mM DTT. Compared to T7 Endonuclease I (supplier N), MCLAB’s T4 Endonuclease VII resolves 4-way Holliday Junctions at a higher yield in 30 minutes with less enzyme. 2. Mix well and incubate the reaction @ 37°C for 30min. 3. 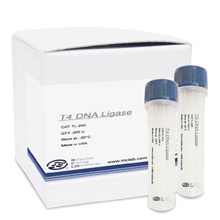 Use 1 µl reaction to analyze the cleaved fragments on Capillary electrophoresis. 3. Run a 2% agarose gel and check for cleaved bands. 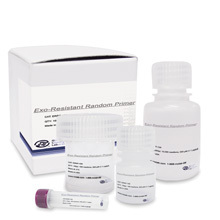 10 units of the enzyme (278 fmol protein, molar ratio 1:70 (Enzyme:Substrate)) resolve 64% of 4-way Junctions. 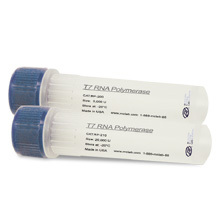 40 units of the enzyme (368 fmol protein, molar ratio 1:50 (Enzyme:Substrate)) resolve 43% of 4-way Junctions. 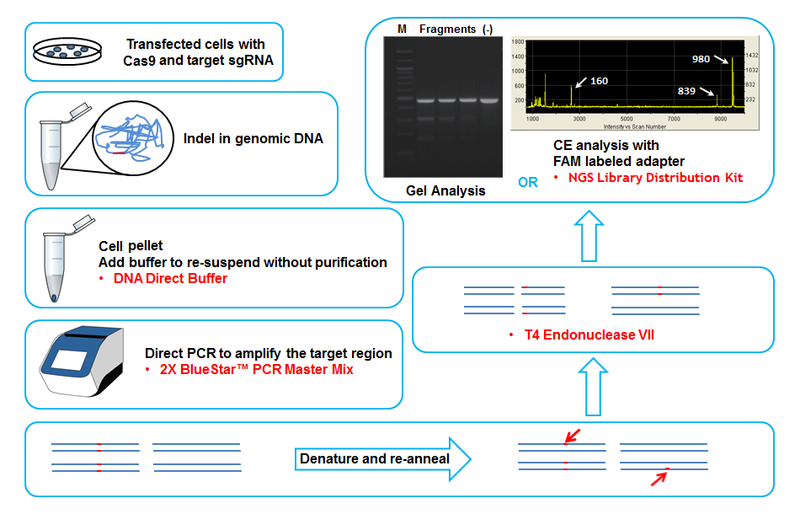 * See Figure 2 for T4 endonuclease VII and T7 endonuclease I activity comparison result. 1. Golz, S., Birkenbihl, R. P., and Kemper, B. (1995), DNA Research 2, 277-284.